* didn’t make a wallpost and liked FB pages. * didn’t make a wallpost. Profile not in public. * Didn’t tag Pinay Mama and Sqwishland properly. Didn’t indicate who she referred. * wall post is not available. * no post in twitter. 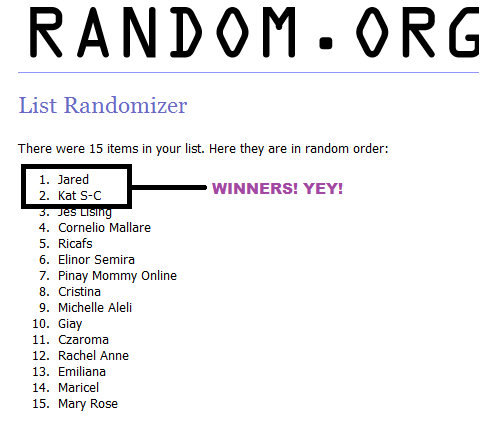 CONGRATULATIONS TO KAT S-C AND JARED’S MUM!! Winning is not that easy especially if it’s a random drawing but lucky for those who keeps on winning whether its by points or random draw. For me, I just don’t depend my future in joining online contests because I don’t have luck in any way. I have to study well and look for a decent job with regular wage so looking up to Guide to Online Schools is what I do during my free time. I wanted to go schooling even if I am still breastfeeding. There is also a site dedicated about how to apply for student loans. Of course, I am still joining contests because I love it, it’s just I don’t depend our bills payment on it. Weeeee Sinuwerte din! Thanks so much and congrats to Vix din! Thanks Pinay Mama and Sqwishland!! Yay! Congrats to the two mommies! PMC represent! Hindi pala ako nakasali dito, toinks!